Instead of celebrating a birthday milestone with an expensive meal in the hundreds, I chose something special and more low-key that my entire little family could enjoy. 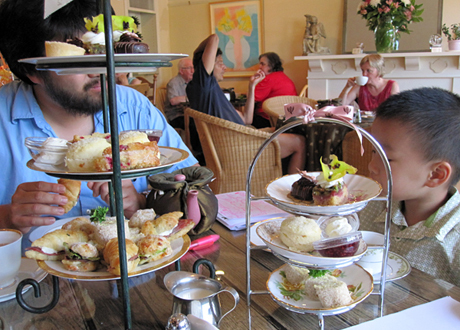 The Secret Garden Tea Company in Kerrisdale offers a lovely high tea with a most delicious menu for both adults and children. Reservations can be made for 12pm, 2pm & 4pm daily, $25.95 for adults and $16.95 for children (8 and under). The adult high tea offered to us included an endless pot of a hot tea of our choosing (from a large list of 40 types including black, herbal, roobois and even decaf teas!) along with the star of the show, a 3 tiered tray of yummy delights (which changes often other than some kind of scone variation & the lemon tart). From bottom plate upwards…. 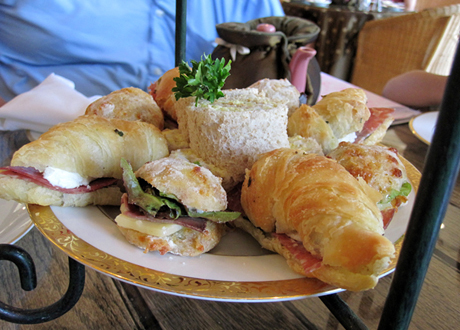 Savory: Mini croissant with genoa salami and soft cheese, Roast beef on mini cibatta with mild cheese, and Egg salad pinwheels. 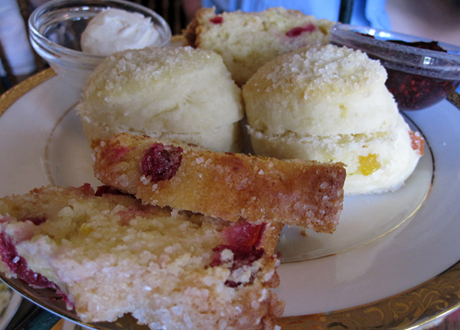 Tea Sweets: Apricot scones with Devonshire clotted cream and raspberry jam, and Cranberry coffee cake. 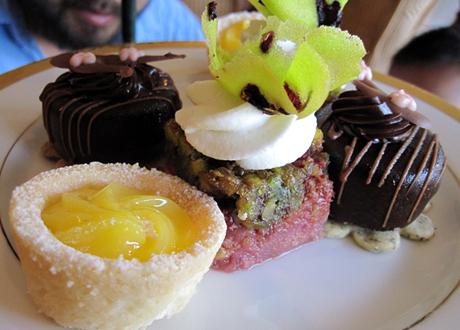 Sweet Bites: Chocolate truffle on graham cracker, Pistachio raspberry cake with whipped crème & kiwi fruit crisp, and Lemon tart. Everything was fresh and quite satisfying compared to my last visit, which seemed a bit bland and some ingredients were a touch dry. I probably overdid it on the tea but I was enjoying myself way too much. The highlights were the flaky lemon tarts (like the way my mom makes them), croissants and the apricot scones. 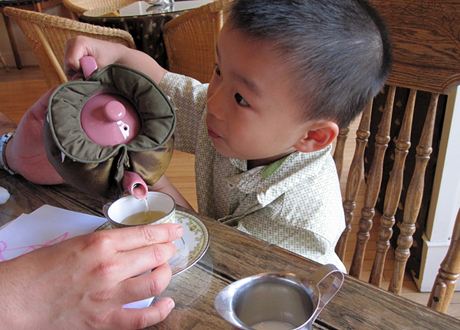 What impressed me immensely was the child’s version of high tea: a teapot full of apple juice with mini teacups so they can participate too! How cool is that? The child’s meal was a similar but with a smaller offering—no lemon tarts, coffee cake, mini croissants or cibatta—and the addition of mini heart-shaped ham & cheese sandwiches. Easily a kid favorite! The best part of sharing a relaxed afternoon tea with my loved ones was the comfortable time spent in a beautiful setting. There was no rush for another seating, we were served promptly and checked on often for beverage top-ups. 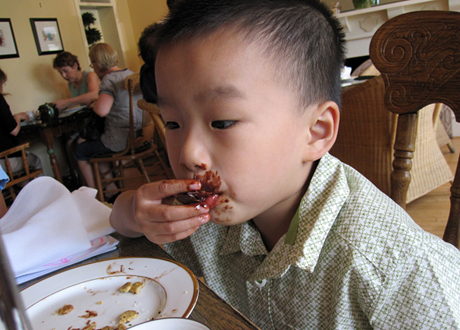 Our son was able to sample some of our croissants and REALLY enjoyed the chocolate truffle! Reservations are recommended and do take advantage of their little store in the back to buy some pastries, teas and other goodies. They do offer a “Secret Garden to Go” but I recommend a nice sit down version with good company and plenty of time. After Dinner Coffee Dessert /Foodists at The Urban Tea Merchant /Ice Cream, Mexi-Style.